-The board can use the same firmware as Ramps1.4. MKS Base is designed to be flexible in the user's power source availability, allowing any power supply from 12V-24V. -6x end stop connectors with power supply Xmin/Xmax/Ymin/Ymax/Zmin/Zmax. 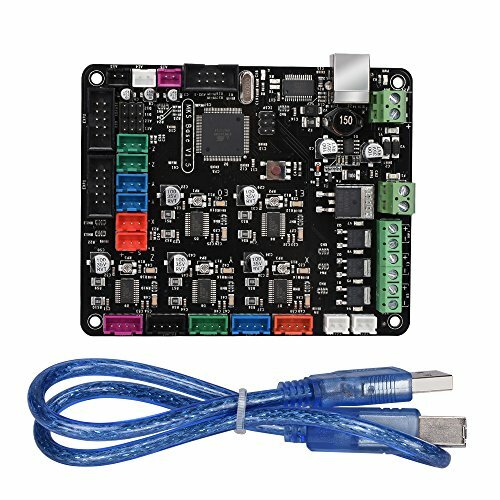 -MKS-BASE is suitable for 3D printer manufacturers on batch production, and being used as main control board. Relative to the Ramps1.4, it adds E1 heating output. -MKS-BASE is suitable for dual-Extruder machine. Arduino MEGA compatible Atmega2560 and FT232 processors are compatible with all RAMPS class firmware. Easy DISPLAY + SD-CARD connector, RepRap Discount SmartController compatible pin header on board. Up to 5 motor driver with A4982.